Somewhere between Pepper Adams and Gary Smulyan is that harmonic happy place where you will find one of the finest bari players hanging out, Adam Schroeder. Does anyone remember melody? 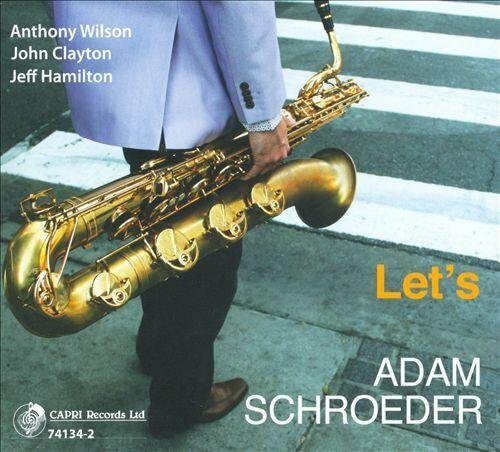 Adam Schroeder and a band that includes bassist John Clayton, drummer Jeff Hamilton and rising star in guitarist Anthony Wilson ride the groove of a melodic swing and an improvisational mother load of lyrical fun. Jazz was made for dancing and if your top tapping receptors don't seem to be engaged about :30 seconds in then perhaps you are waiting on your autopsy report. Schroeder is a brilliant technician but most importantly he has the artistic soul of a giant that allows free reign of lyrical intent. The bands chemistry and innate ability to occasionally play follow the leader is deceptively subtle. Make no mistake, this formidable 4tet is a collective that gives no quarter and asks for none in return. This is why we play and enjoy music. The funky Schroeder original "Just Clap Your Hands" speaks for itself. Musicians are notorious for their sense of humor and sometimes they are even funny. The Schroeder smoker "A Hawkeye, A Hoosier, & Two Cali Cats" borders on infectious with an old school swing you just don't hear enough of anymore. While the fun is off the charts, this is serious business. The music runs the show including stellar covers of "Southside Samba" and a dangerous but delightful reharm of the Stevie Wonder tune "You & I." There are a great many baritone saxophone players working the scene today, problem is there are not that many players that stick with you. Adam Schroeder is an artist that will stay with you long after the final tune. One of the finests instrumentalists I have heard this year and Let's will definitely be on my year end best of 2014!